We had a record attendance over 90 men enjoyed a bountiful barbecue spread that included NC BBQ, hamburgers, hot dogs, and apple pie. 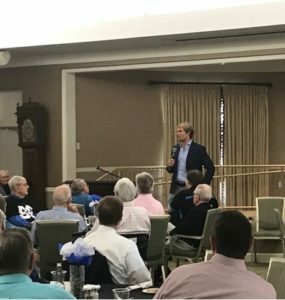 Greg delighted the audience with his life story of having been raised in a football family, coached by his highly successful dad – winning a NJ state championship as senior, initially electing to attend Notre Dame and then changing his mind and transferring to Miami in 2003. Graduating early from UM along with his soon to be wife, Kara, who he met at UM, Greg was drafted in the first round by the Chicago Bears. After four years and a near Super Bowl appearance, he surprisingly was traded to the Charlotte Panthers in 2011. He sheepishly admitted he had no idea where Charlotte was. He was a New Jersey boy who had spent his adult life in either Miami or Chicago. While he once thought he’d be in Chicago his entire career, it was that unexpected change that helped prepare him and his wife for the later challenge of caring for a child born with a serious heart defect. Just prior to the trade to Charlotte, they welcomed their first son into the world. Not long thereafter they learned Kara was pregnant with twins, one of the which – the boy, had a serious heart defect requiring open heart surgery at 2 days old and again at 2 years old. Today, the twins are both 5 and the son is doing extraordinarily well. They once thought the best care they could have received would have been in Chicago but later learned of the expert care available to them at the Levine Children’s Hospital – for which they are eternally grateful to the physicians and nursing team. As a result, their foundation “Heartest Yard,” is dedicated to families in similar situations. 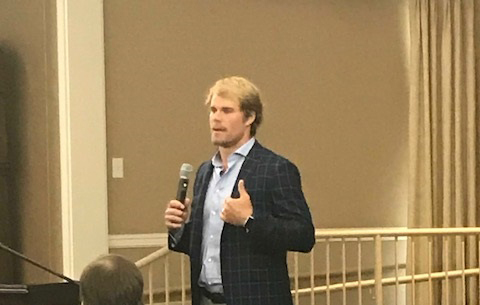 Greg spoke of how much this singular event impacted him and changed forever his perspective on life, that’s not about sports or his accomplishments as an athlete but of giving back and helping others in great need.